​Unifor, Canada's largest private sector union, is preparing for its second Constitutional Convention since forming on the Labour Day long weekend in 2013. The union's second convention will be held in Canada's Capital - Ottawa, Ontario from August 22 to 26, 2016. The convention is being held at the Shaw Centre (formerly known as the Ottawa Convention Centre), 55 Colonel By Drive in downtown Ottawa. Unifor National Council 4000 and its five Regional Local Unions from across Canada will be sending delegates to this important event. Some of the keynote speakers scheduled to speak at the convention include Canada's Prime Minister Justin Trudeau, Alberta Premier Rachel Notley, President of the International Trade Union Confederation (ITUC) Sharan Burrow, President of the Canadian Labour Congress (CLC) Hassan Yussuff, President of the Fédération Interprofessionnelle de la santé du Québec (FIQ) Régine Laurent, and of course Unifor National President Jerry Dias. ​Unifor will be offering a mobile event guide to attendees featuring speaker information, session schedules, maps and much more. It will be accessible from all devices with an internet browser: smartphones, tablets, laptops and desktops. If members won’t be attending the convention live in Ottawa, Unifor will be live streaming much of the convention at the new Unifor Live portal. All streams will be archived on the site. Convention videos will also be posted. Be sure to tune in and join the conversation on social media with the hashtag #Unifor2016. 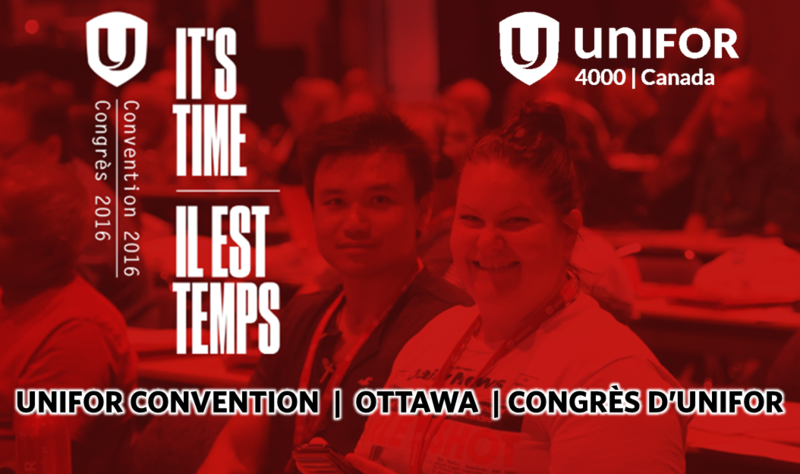 ​Tap here to access more information on the convention from off the Unifor website. Below is the video released in 2013 to celebrate the formation of Unifor, following the merger of the CAW and CEP. The video features the music of Canadian singer Serena Ryder and her song, Stompa. Related: September 1, 2013 - Canada's Newest Union is Here!